There are generally two responses when we tell people that we've quit our jobs to travel across Africa from Cairo to Cape Town. Some folks are excited and even inspired to do the same. Others just shake their heads. As we make our way home to the Cape Flats over nearly 100 days, the following stories capture some of our wonderful adventures. By FARZANA PALEKER & KAYUM AHMED. When Mustafa suggests we have dinner together, we are a little uncertain. Earlier in the day, Sudanese border control officials banged on our cabin door, inviting us to complete various forms in a sweaty room just opposite the kitchen. What happens in the kitchen should probably stay in the kitchen. But before we know it, we are sitting around a table in the dining area of the ferry from Egypt crossing Lake Nasser into Sudan. We noticed a few foreigners making the train journey from Cairo to Aswan along with us on the previous day. On the ferry, however, and the remainder of our journey to Khartoum, we are the only foreigners using public transport. Photo: Ferry from Aswan to Wadi Halfa. We are joined by four of Mustafa’s Sudanese friends, one of whom bears an uncanny resemblance to the American comedian, Steve Harvey. Most of them work in other Arab countries, where they complain that their accented Arabic is not easily understood. We can relate somewhat, since it’s pretty much how we feel when upon hearing our Cape Flats accent, some Americans ask us whether English is our first language. The cook brings us bowls of beans, fresh vegetables and yoghurt, which are mixed together with boiled eggs. As we join our hosts in dipping our fingers into the bowl and scooping the delicious mixture into our mouths, we look at each other. We discover later that one of us was thinking about hand sanitiser. The other remembered that the Steve Harvey doppelgänger was playing with his toes earlier that evening as we sat on the deck watching the sun set. Mustafa, sensing our apprehension, explains that all Sudanese wash their hands before eating. The music of Mahmood Abdel Aziz plays in the background as we enjoy our excellent meal, completed with some oranges and a strong ginger-infused coffee. The warmth and generosity of the Sudanese continue to surprise us as our new group of friends check on us during the 17-hour ferry ride to the border town of Wadi Halfa. The small dusty desert village of Wadi Halfa is made up of buildings that resemble shacks. “Smells like feet” is the first thing I say to Kayum when we are shown to our hostel room. I’m the only woman in this section, sharing a communal bathroom with seven other men. Wisely, I unpack my brand new “She-wee” – a hard, silicone funnel type urination aid for women. I discover an Eastern-style toilet with a shower and drain directly in front of it. No shower head, just a pipe with an opening, water dripping on my head as I perform the task at hand. She-wee works well on the first test drive. ‘Act Like a Lady, Pee Like a Man’ – a rather apt description derived from Steve Harvey’s best-selling book Act Like a Lady, Think Like a Man. After a sleepless night we converge at the bus depot at 4:30am to catch the daily bus to Khartoum. We find the rest of our ferry friends having coffee and zelabia – a delicacy much like the “bolla” my mum makes on Sunday mornings. Endless security checkpoints and 13 hours of televised Sudanese entertainment later, we reach Khartoum. It is an unremarkable city peppered with futuristic gleaming steel and blue skyscrapers courtesy of the Chinese. Election posters of Omar al-Bashir (and only al-Bashir) cover walls and signposts along the way to our B’nB. Our modest B’nB on the edge of the city seems like an oasis. The B’nB is unofficially permitted to serve alcohol – the only place in Khartoum that does so, thereby barring locals from entering the grounds. Foreigners based in the city converge here on Thursday evenings to mark the start of the weekend. By 10pm Kayum and I are dancing to Nigerian hip-hop while one of the guests plays music using his phone and a speaker. The B’nB owner says he’s received warnings by security police to keep things quiet, particularly during election season. So at about 3am, when people start jumping into the pool, he turns off the lights, signalling the end of the party. A few hours later, we find ourselves in sweltering heat, swaying to another beat. 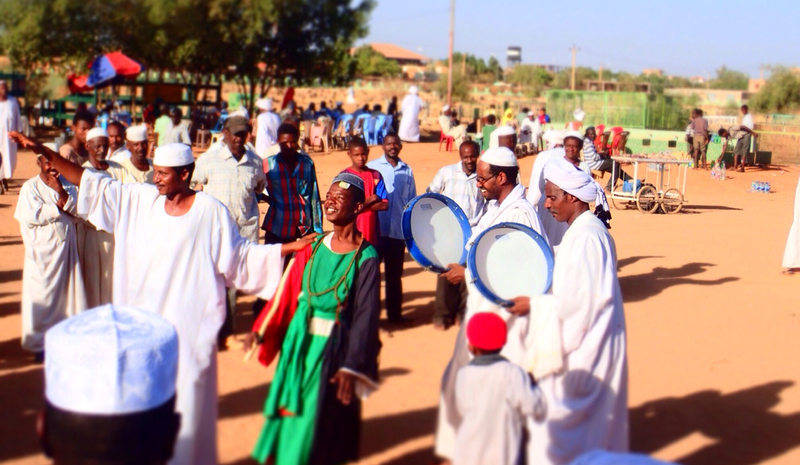 This time, that of drums and melodious recitations by whirling Dervishes dancing in praise of Hamed-el Nil. Hundreds of men, some spinning around, others moving rhythmically from side to side, all smiling faces pointing upward. The mood is festive and there are even a handful of women who join in some distance away from the men, their movements more measured, heads bowed down with some faces completely covered.